Over the last year, since 2009, the Toyota car company has recalled over 10 million automobiles. The reason was primarily faulty accelerator pedals and problems with brakes. 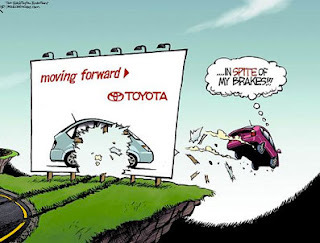 These defects gave new meaning to the Toyota marketing slogan: "Moving Forward" - and how! Now comes news the company is recalling 260,000 Lexus and Crown models due to faulty engine valves. Funny, how since the previous problems, Toyota has been advertising how safety conscious and quality control driven (no pun intended) the company is. We should have seen it coming. In an attempt to assure consumers Gulf States Toyota President Toby Hynes was quoted recently as saying, "The core Toyota product is still the same product." This must be a company media line because the automaker's most recent television commericals use the same thing - along the lines that while other things have changed in our lives, Toyota remains the same. Yikes! We should have seen the signs. Actually, it was shown, and it was a big hit. In Norway, that is. Cruella: Ah, it was shown. But then I guess it was banned. What a great ad. There were a series of editorial cartoons over here with drivers telling cops, "But it's a Toyota" in an effort to avoid a speeding ticket. It's unfortunate that after those ads about quality control the company still has problems. But wait! The latest commercial I keep hearing is that "We at Toyota are investing one million dollars an hour to ensure your safety." Forget my safety, just hand over some of that moolah. I'll take care of my own safety. Quirks: Yeah, take that money and buy a used Pinto. You might be better off. First of all I'm not Lexus material so I'm cool with those foul ups. Secondly, I think that commercial should have aired. Shows a bit of self deprecation and tongue in cheek humility. Would have been great. Don: My wallet tells me I'm not Lexus material either. I guess the closest you'll come to a Lexus is if one drives into that pothole in front of your house! Apparently the ad did air in Norway, the market it was intended for, according to Cruella above, but I think it got yanked. You Tube says it was banned. I loved it! I think I saw that commercial before it got pulled, but I could be wrong. A fun ad! I had a '88 4-Runner - what a fun vehicle and the best looking of the line. It also served well on those snow days when I lived out in the boonies. 00dozo: Hmm, the 80s? I was driving a K-Car wagon. Life's changed a lot since then - um, for the better. Why would that be banned? I think it's great. Not that it'll get me to buy a Toyota, but still. Chris: I liked it too. And the model "drives" me to distraction. Oh, I guess that was kinda the plot line of the ad wasn't it? I agree with Quirky, just give me some of that million an hour and I'll take care of myself. We have a guy here in prison because his Toyota killed a family one Sunday morning. It's on appeal now but he has already served 3 years. Maybe they should give some of those millions to those two families? Jen: Wow, that's an amazing story. Imagine if it's proven it was the car to blame. Could be the final nail in Toyota's coffin.